Despite the fact that the BBC has a permanent presence in Beirut, the last time its audiences saw any reporting from southern Lebanon was over three years ago. Last year, Hizballah violations of UNSC resolution 1701 received no coverage whatsoever. Calls for a review of the mandate of the UN peacekeeping force in Lebanon – UNIFIL – in August 2017 were not reported by the BBC in the English language until three weeks after the story broke. The Jerusalem Post recently published an article which is based on a French newspaper’s interviews with UNIFIL soldiers based in south Lebanon. “The UN force in Lebanon has accused Hezbollah and the Lebanese Army of hampering their work, which includes spying on the peacekeepers, in a report due to appear on the website of French newspaper Le Journal du Dimanche, on Friday. The dearth of up to date BBC reporting on the situation in southern Lebanon and UNIFIL’s failure to implement UNSC resolution 1701 obviously means that if and when conflict between Israel and Hizballah does break out again, the corporation’s audiences – as well as the journalists it sends to cover the events – will lack the insight crucial to understanding of the background and context to that story. A long-running dispute between Lebanon and Israel concerning land and maritime borders has recently been making headlines again – although those getting their news from the BBC would not be aware of that fact. The US Secretary of State Rex Tillerson’s related visit to Beirut on February 15th (as part of a Middle East tour that was barely covered by the corporation) was not reported and neither were related threats from the head of a terrorist organisation. “During a press conference in Beirut on Thursday, Tillerson, who arrived in Lebanon as part of his Mideast trip, discussed the growing tensions between Israel and Lebanon, and urged Lebanese leaders to ensure the border between the two countries remains calm. The US has been trying to mediate between Israel and Lebanon on that issue for some time – as explained in a comprehensive article by Oded Eran of the INSS. “In late 2011, Israel, out of a willingness to compromise, began to look for diplomatic ways to resolve the developing dispute. In inter-ministerial consultations, the decision was taken not to grant new licenses for the area under dispute in order to facilitate a compromise solution. It was decided not to use UNIFIL as a channel for discussion between Israel and Lebanon, since the mandate of the Force does not refer to the maritime border, and Israel prefers to avoid UN mediation. The Israel interest in mediation led to several contacts by third parties, and ultimately American mediation was the preferred option. As the Times of Israel reported, the dispute also includes a barrier which is being constructed by Israel along its border with Lebanon. “On Monday, Lebanese military officials told their Israeli counterparts during face-to-face talks that the border wall violates Lebanon’s sovereign territory. Of course under the terms of UN Security Council resolution 1701, the border area is supposed to be “free of any armed personnel, assets and weapons other than those of the Government of Lebanon and of UNIFIL”. The day after Mr Tillerson’s visit, Lebanon dismissed the US mediation efforts. “The speaker of Lebanon’s parliament on Friday rejected a US proposal to resolve a maritime border dispute between the country and Israel. And on the same day, the leader of the Hizballah terror organisation weighed in. “Hezbollah on Friday urged Lebanon to stand firm in its offshore energy dispute with Israel and warned it could act against Israeli oil facilities if necessary, as the U.S. mediates between the two countries. In a televised address, the leader of the heavily-armed, Iran-backed movement, Sayyed Hassan Nasrallah, described the issue as a “battle for all of Lebanon”. Yet oddly, while this dispute obviously has the potential to escalate into more than verbal sabre-rattling, BBC audiences are not even aware of its existence. Last year BBC Radio 4 produced a couple of programmes about a call from Gulf States to close certain media organisations – including Al Jazeera and Middle East Eye – in which the story was framed as an assault on media freedom. Also last year, the BBC produced reports concerning Israeli complaints about Al Jazeera that were described as “an attack on free and independent media”. Given that proclaimed interest in freedom of the press and the BBC’s track record of calling out some past cases of prison terms given to journalists, one might have therefore expected to see at least one report about a journalist sentenced to imprisonment in absentia by a military court. “A Lebanese military court has handed down a six-month prison sentence to a journalist for comments critical of the Lebanese army, highlighting the close ties the army has with Hezbollah, the Associated Press reported Thursday. Curiously however, BBC audiences have to date seen no reporting whatsoever of Hanin Ghaddar’s story. The BBC’s Martin Patience recently announced his upcoming relocation to Beirut on Twitter. This is not Patience’s first posting in the Middle East: he spent two years reporting for the BBC from Jerusalem between 2006 and 2008 and was in the Gaza Strip for part of the summer 2014 conflict. One story already waiting for him in Beirut (that has not been covered by the BBC to date) is that of the reports concerning alleged Iranian-built underground missile factories in Lebanon that have been around for some months. The Times of Israel brings further information. “The Iranian general who first revealed the existence of the factories said that they were built because Israel had destroyed munitions factories in Sudan and hit weapons convoys in Syria en route to Hezbollah. 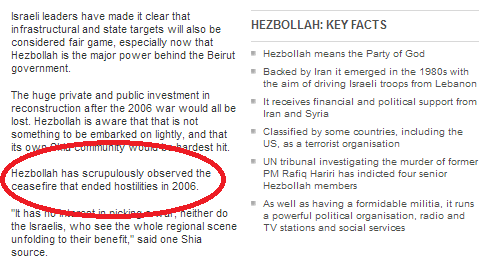 The BBC’s record of reporting Hizballah’s violations of UNSC resolution 1701, it is of course very dismal. Whether or not it will improve with Martin Patience’s arrival in Beirut and audiences will finally get to hear about this story and others remains to be seen. As noted in part one of this post the BBC’s correspondent in Beirut, Rami Ruhayem, produced both audio and written reports on the tenth anniversary of the Second Lebanon War on July 12th. “In a region transformed by the wars in Syria and Iraq, the stand-off between Israel and Hezbollah, the Shia jihadist group it last confronted in full-scale warfare in 2006, appears to be one thing that has not changed. It went on to amplify unfounded rumour disseminated by a pro-Hizballah Lebanese newspaper. That was followed by a partial description of the events which sparked the Second Lebanon War in which the missile attacks on Israeli civilian communities that took place together with the infiltration into Israeli sovereign territory were erased. Ruhayem again presented a picture of Lebanese casualties during that war which – although better than his audio report – failed to provide audiences with accurate information. As noted previously, Lebanese figures do not differentiate between civilians and combatants but Lebanese officials reported even before the conflict was over that some 500 of the dead were Hizballah combatants and UN officials gave similar figures. Israeli estimates stand at around 600 – more than half of the total Lebanese casualty figures. Having told readers that “Israel lost and Hezbollah won”, Ruhayem went on to describe the effects of the war in Lebanon but provided no comparative information about the number of people displaced or infrastructure and homes damaged on the other side of the border. As in his audio report, he then went on to describe the ‘Dahiya doctrine’ but without clarifying that the Dahiya neighbourhood of Beirut is Hizballah’s command and control centre. “Israel laid out a strategy of deterrence, first made public by Maj Gen Gadi Eizenkot in 2008 when he was head of the Israeli army’s Northern Command. He said that what happened in Dahiya, the southern suburb of Beirut in which neighbourhoods were flattened by Israeli airstrikes in 2006, would “happen in every village from which shots were fired in the direction of Israel”. Gen Eizenkot, now Israeli chief of staff, articulated what came to be known as the Dahiya Doctrine. “We will wield disproportionate power,” he said, “and cause immense damage and destruction. This isn’t a suggestion. It’s a plan that has already been authorised. But the most remarkable feature of this article is its problematic presentation of Hizballah’s involvement in the Syrian civil war – once again without any mention being made of Iran’s role in that development. Their rationale for involvement in support of President Assad has evolved, but a dominant theme is that Syria has been the backbone of the resistance against Israel, and that the attacks on the regime are aimed at undermining Hezbollah by depriving them of an ally that has provided much needed logistical support. Ruhayem did not present any challenge to that very transparent Hizballah propaganda or even bother to remind readers that the Syrian civil war began as a popular uprising against the repressive Assad regime and that Israel is not involved in the war in Syria. In contrast to his audio report, Ruhayem did note Hizballah’s augmented missile arsenal but failed to tell readers where it came from or that it is a clear breach of UN SC resolution 1701. He yet again whitewashed Hizballah’s origins while promoting a scenario unsupported by any evidence. “”We are talking about a defensive war, in which we are the ones who are on the receiving end of aggression,” Hassan Nasrallah said. This reflects Hezbollah’s new posture and priorities. Throughout the 1980s and 1990s, they kept up a persistent guerrilla campaign against the Israeli occupation of south Lebanon, and it was through attrition over almost two decades that they forced them out in 2000. Some in Israel believe it is better for them to wait and watch than wage war now. It is of course highly unlikely that Israel would do any such thing unless Hizballah took steps which left it no alternative. But if conflict between Israel and Hizballah did break out again, BBC audiences would obviously be seriously lacking the background information crucial to their understanding of that event because reports like these two from Rami Ruhayem fail to provide them with information concerning relevant issues such as the failure of UN SC resolution 1701 to achieve its aims, the rearming of Hizballah and its use of communities in southern Lebanon as human shields and Iran’s patronage of the terror organization which the BBC refuses even to describe in accurate terminology. One might have perhaps thought that a media organisation that describes itself as “the standard-setter for international journalism” would at some point in the last decade have got round to conducting a serious investigation into why the UN Security Council resolution which ended the 2006 conflict has failed to prevent the conditions being put in place for a third devastating war in Lebanon. Why doesn’t the BBC present an accurate picture of Hizballah? 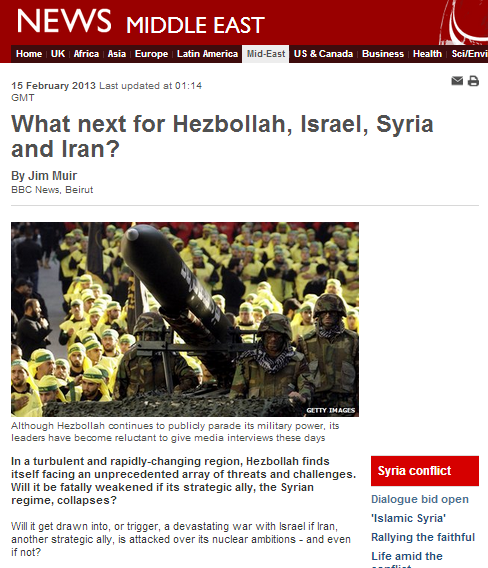 On February 15th 2013 an article by the BBC’s Beirut correspondent Jim Muir entitled “What next for Hezbollah, Israel, Syria and Iran?” appeared on the BBC News website’s Middle East page. Just one day after the publication of Muir’s article, in which he claimed that “[g]iven the delicate, complex and explosive situation Hezbollah finds itself in, it is hardly surprising that leaders and officials have drawn in and give virtually no media interviews these days to share their views on the above questions”, Hassan Nasrallah clarified the organisation’s approach on several issues when he gave a speech on Hizballah’s “martyrs day”. “The resistance in Lebanon is fully equipped and ready nowadays, we have everything we need to maintain our power… We don’t need any arms from Syria… Israel realizes that”. “3. Emphasizes the importance of the extension of the control of the Government of Lebanon over all Lebanese territory in accordance with the provisions of resolution 1559 (2004) and resolution 1680 (2006), and of the relevant provisions of the Taif Accords, for it to exercise its full sovereignty, so that there will be no weapons without the consent of the Government of Lebanon and no authority other than that of the Government of Lebanon“. Muir himself states earlier on in the article that “Hezbollah has undoubtedly been building up its arsenal since the last one [war] in 2006”, so either he is obviously aware that the terrorist organisation has contravened that clause of the ceasefire agreement or he is unaware of that agreement’s terms. “security arrangements to prevent the resumption of hostilities, including the establishment between the Blue Line and the Litani river of an area free of any armed personnel, assets and weapons other than those of the Government of Lebanon and of UNIFIL as authorized in paragraph 11, deployed in this area”. “full implementation of the relevant provisions of the Taif Accords, and of resolutions 1559 (2004) and 1680 (2006), that require the disarmament of all armed groups in Lebanon, so that, pursuant to the Lebanese cabinet decision of 27 July 2006, there will be no weapons or authority in Lebanon other than that of the Lebanese State“. “no foreign forces in Lebanon without the consent of its Government”. Despite the ceasefire agreement, Hizballah is still supplied, trained, financed and enabled by its Iranian patrons, with members of the Quds force present in Lebanon as was recently highlighted by the death of Hassan Shateri. The situation today is that Hizballah has rearmed even more extensively since 2006 and in violation of resolution 1701, it maintains a presence in the whole of southern Lebanon south of the Litani River, with hundreds of arms dumps concealed in towns and villages, thereby turning the local civilian population into human shields. The short video below, for example, shows the positions of weapons storage facilities in the village of al Khiam – population around 23,000 – as of 2010. The Israeli town of Metulla in the foreground, with al Khiam in the middle distance on the ridge. With regard to violations of the ceasefire agreement in the form of rocket fire alone, since the end of the Second Lebanon War in August 2006 there have been numerous incidents including one in June 2007, five in 2009, two in 2011 and three in 2012 – claimed by proxy paramilitary groups of one description or another, but clearly with the tacit approval (if not more) of Hizballah, which exercises considerable control over the area. Extensively quoting an assortment of anonymous “observers and analysts” including “Shia sources” and unnamed “Western diplomats”, Muir does his best in this article to downplay Hizballah’s part in the conflict in Syria, the scope of its role as an Iranian proxy and its destabilising influence both at home and abroad – at times even presenting the theocratic sectarian militia as a ‘voice of reason’ in the Middle East and inventing a ‘moderated’ Hizballah. “Ironically, some western diplomats have even come to see Hezbollah as a factor for stability in the Lebanese equation. Significantly too, Muir promotes the illusion of an “imbalance of power”, concealing from his audience the real relevance of the fact that Hizballah is merely one tip of a large Iranian iceberg which destabilizes the region (as well as places further afield) on numerous fronts. By presenting a false picture of Hizballah’s violations of UN SC resolution 1701, Muir not only fails to fulfil his organisation’s stated aim of informing BBC audiences about the wider world and compromises the BBC’s obligation to accuracy, but he is also clearly giving oxygen to a specific political agenda which some of his mysterious “Western diplomat” sources (which, interestingly, apparently cannot be named, thereby denying the reader the ability to judge those opinions in context) seem very keen to promote. In doing that, Muir also severely compromises the BBC’s reputation as an ‘independent’ broadcaster.